An inauguration mainly refers to the process of swearing a person into office and thus making that person the incumbent. Such an inauguration commonly occurs through a formal ceremony or special event. The historical source of the word “inauguration” stems from the Latin augur, which refers to the rituals of ancient Roman priests seeking to interpret if it was the will of the gods for a public official to be deemed worthy to assume office. 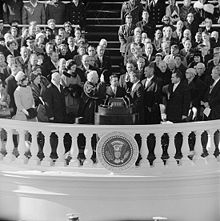 The inaugurations of public figures, especially those of political leaders, often feature lavish ceremonies in which the figure publicly takes his or her oath of office (sometimes called "swearing-in"), often in front of a large crowd of spectators. A monarchical inauguration may take on different forms depending on the nation: they may undergo a coronation rite or may simply be required to take an oath in the presence of a country's legislature. The "inaugural address" is a speech given during this ceremony which informs the people of his or her intentions as a leader. A famous inauguration speech is John F. Kennedy's. Other than personal inaugurations, the term can also refer to the official opening or beginning of an institution or structure, for example the inauguration of a new Canada–United States border crossing. An "inauguration site" is a ceremonial site that is for someone of a public figure. ^ "Cambridge Dictionary's Entry on Inauguration". Cambridge English Dictionary. ^ "Oxford Dictionaries' Entry on Inauguration". Oxford Dictionaries. Wikimedia Commons has media related to Inaugurations.